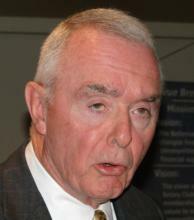 Barry McCaffrey served in the United States Army for 32 years and retired as a four-star General. At retirement he was the most highly decorated serving General, having been awarded three Purple Heart medals for wounds received in his four combat tours – as well as twice awarded the Distinguished Service Cross, the nation's second highest award for valor. He also twice was awarded the Silver Star for valor. For five years after leaving the military, Barry McCaffrey served as the nation's Cabinet Officer in charge of U.S. Drug Policy. He was confirmed for this position by unanimous vote by the U.S. Senate. For this period of public service, General McCaffrey received many honors including: the Department of Health and Human Service Lifetime Achievement Award for Extraordinary Achievements in the Field of Substance Abuse Prevention (2004), the United States Coast Guard Distinguished Public Service Award, the Norman E. Zinberg Award of the Harvard Medical School, the Federal Law Enforcement Foundation's National Service Award, and the Community Anti-Drug Coalitions of America Lifetime Achievement Award. After leaving government service, Barry McCaffrey served as the Bradley Distinguished Professor of International Security Studies from January 2001 to May 2005; and then as an Adjunct Professor of International Security Studies from May 2005 to December 2010 at the United States Military Academy at West Point, NY. Barry McCaffrey graduated from Phillips Academy, Andover, Mass. in 1960; from West Point with a BS in 1964; earned an MA degree in American Government from American University; and attended the Harvard University National Security Program as well as the Business School Executive Education Program. The Middle East; especially Iran, Afghanistan, Pakistan, etc. Gen. McCaffrey said he believes the wars in Iraq and Afghanistan were fully justified but poorly executed. He believes that Iraq will be okay as they have oil, water, educated people and access to the sea. On the other hand, Afghanistan is generally illiterate, although the people learn rapidly through doing. They have had 40 years of war and Karzai is considered a disaster. There are 44 terrorists groups in Afghanistan which are funded through illegal activities such as drug sales and cigarette smuggling to neighboring countries. North Korea is a poorly understood country. Their first leader was considered a hero. Their second leader, Kim Jong Il was a tyrant and is known to have killed over 2,000 of his people. Today’s leader, Kim Jong Um, is an unknown. Gen. McCaffrey believes that in case of war with North Korea, North Korea will be taken out in six months. However, with Seoul, South Korea, being close to the border, in six months of war the South would sustain considerable damage. Cyber hackers are already into industrial businesses stealing secret information as well as patents and copyrights. The Chinese military seems to be a major source of this hacking. We are lacking in cyber security and there is a need to get our best brains to address this issue. Gen. McCaffrey believes the best brains, represented by Ph.D.’s, are currently located in the National Security Administration. Cyber hacking so far is limited to lifting information, hacking into actual operations of equipment is not evident so far. Our biggest threat from China is espionage as the Chinese are trying to get control of satellites, etc. In answer to a question Gen. McCaffrey indicated that fiscal decisions should be at the discretion of the military officers. Unfortunately appropriations law must originate in the House of Representatives and any attempt to decrease spending in a District will create serious objection from the Representative of that District as jobs and contracts in the Distract are paramount. Noon Club and at this point we are ahead, but nothing is sure until the contest is over! Phil Salvatori is doing better and is expected to come home this next week. Alan Pratt for the invocation and flag salute. Alan commented on all we have to be thankful for, led in prayer and then led the Pledge of Allegiance. Kit Bowerman then took over to introduce guests as there were no visiting Rotarians. Chris announced that the “Memory Book” for Norm Johnson’s wife would be making the rounds this morning so each person could write remembrances of Norm Johnson. John Schwager and Martin Clavijo presented a check for $7,000 to Paul Wali for the YMCA. They also showed pictured of the kids playground which the “Newbies” had rehabilitated. Good job, you people! Girish Bhatia made a 10K presentation including a short video of last year’s 10K. The Bellevue 10K is our major fund raiser and everyone needs to participate. We are 51 runners short of last year’s count so we need to talk up the 10K and encourage more runners to sign up. Everyone is encouraged to include the 10K on their Facebook page. John Schwager, Fred Janssen and Martin Clavijo presented a report on their recent activities on a water project in Columbia. They were accompanied in their presentation by Juan Pablo Chiquiza a local businessman with relations in Columbia. The project is the addition of a filtration system to the existing water distribution system. The BBRC team anticipates returning to Columbia in the near future to observe the completion of the project. The project cost is $21K which came from seven different Rotary sources. Tim Johnstone, SSA, took over and asked each table to name the 13 countries of South America. The prize for the table that got the most countries was fresh ground coffee from Columbia. Colleen Turner, the “Cruise Diva”, made sure her table got all 13 and won the coffee! The SSA then asked those at all other tables to put $2 on the table.